We believe that arms control is a promising, but still only dimly perceived, enlargement on the scope of military strategy. It rests essentially on the recognition that our military relation with potential enemies is not one of pure conflict and opposition, but involves strong elements of mutual interest in the avoidance of a war that neither side wants, in minimizing the costs and risks of the arms competition, and in curtailing the scope and violence of war in the event it occurs. This formulation accumulated so much gravitational pull that alternative definitions of arms control crafted at about the same time have been left to gather dust in my shoe box. For definitions that fell by the wayside, let’s re-open the pages of Arms Control, Disarmament and National Security (1961), edited by Donald G. Brennan. Brennan was present at the creation of arms control, but de-camped when his colleagues became strongly opposed to ballistic missile defenses. 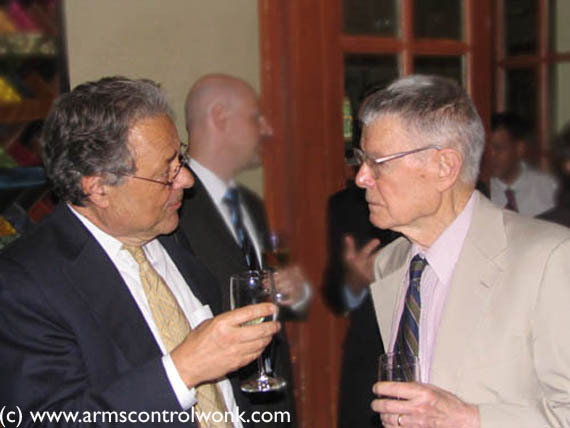 Brennan had the challenging task of shepherding essays conceptualizing arms control from a diverse cast ranging from Erich Fromm and Bernard Feld to Henry Kissinger and Herman Kahn. Needless to say, Schelling and Halperin had more luck weaving together a coherent argument. The goal of responsible arms control measures must be to determine, free of sentimentality, not how to eliminate retaliatory forces but how to maintain an equilibrium between them… A control system will add to stability if it complicates the calculations of the attacker and facilitates those of the defender. Or, put another way, the objective should be to increase the uncertainty about the possibility of success in the mind of the aggressor and to diminish the vulnerability of the defender…The primary goal of any arms control scheme must be to increase stability. A precondition is that both sides should strive to develop invulnerable retaliatory forces. It is useful to think generally of arms control as a cooperative or multilateral approach to armament policy — where ‘armament policy’ includes not only the amount and kind of weapons and forces in being, but also the development, deployment, and utilization of such forces, whether in periods of relaxation, in periods of tension, or in periods of shooting wars … The basic goal of arms control… is to reduce the hazards of present armament policies by a factor greater than the amount of risk introduced by the control measures themselves. The concept of ‘arms control’ includes any agreement among several powers to regulate some aspect of their military capability or potential. We still use the term arms control, even when the practice has moved well beyond its original formulations. I have made the argument elsewhere [Cooperative Threat Reduction, Missile Defense, and the Nuclear Future (2003)] that what used to be known as arms control has morphed into cooperative threat reduction. Either our terminology remains hostage to old verbal habits (akin to references to the “post-Cold War era”), or we have yet to gain clarity about how best to characterize the “post-arms control” era we now live in. Arms Control & military strategy are not the same as disarmament. With the passage of enough time or the consumption of enough intoxicants, anything can be seen to morph into anything else. However, for the purposes of clear and effective communication, I don’t think it is useful to erase distinctions and conflate formerly distinct concepts, or to dilute them with broadened meanings. Therefore, I would not equate arms control, which by a direct reading of the term seeks to impose controls on arms (weapons), or at most “some aspect of… military capability or potential” as per Bowie, with other kinds of “cooperative threat reduction” including confidence-building measures, openness, Codes of Conduct and so on. Actually, equivocation is a strategy of deception and it seems to me that lately some people who are opposed to actual arms control, such as a ban on space weapons, suggest instead some milder formulation such as a Code of Conduct for Spacefaring Nations as a substitute, and would like to argue that such measures, which do not actually address the control of weapons, still somehow qualify as “arms control.” While I agree such measures are desirable in themselves, they do not substitute for measures which actually address and ban or limit (control) arms. I’d be curious to know both what Erich Fromm’s definition was, and why he was asked to give one. Strategic arms control is not new to the nuclear age, see Washington Naval Treaty of 1922. Circumstances and intent have similarities to modern nuclear arms treaties. So, a question, was this and other earlier treaties successful? you raise a false dichotomy between rules and bans on hardware as regards space security. There can be a legitimate debate about what is more pragmatic: starting negotiations with opponents of space AC with talk of bans or starting them with talk of rules. I can’t explain why Erich Fromm was included in this diverse group. Perhaps it was for just this reason — to add diversity to the undertaking. If someone has first-hand knowledge of this, please weigh in. His chapter did not offer a definition of arms control. Instead, Fromm was interested in nuclear disarmament. His chapter sought to explain how this might be accomplished by applying Charles Osgood’s principles of graduated unilateral actions and reciprocal actions. —-I mentioned the idea of convnetional weapons becoming as powerful as tactical nuclear ones, in an earlier commentary. —-Is this related to tactical nukes, in your minds eye? This undated artist’s rendering provided by Boeing Co. shows a ‘massive ordinance penetrator’ or MOP bomb made by Boeing Co. is undergoing testing and is slated to come on line by mid-2010, to become the largest conventional bomb in the U.S. arsenal. The bomb is approximately 20.5 feet long, has a 31.5-inch diameter and a total weight of slightly less than 30,000 pounds. The weapon will carry over 5,300 pounds of explosive material and will deliver more than 10 times the explosive power of its predecessor, the BLU-109. Guided by global positioning system navigation, the MOP will be carried aboard Air Force B-2 bombers. Call it Plan B for dealing with Iran, which recently revealed a long-suspected nuclear site deep inside a mountain near the holy city of Qom. The 15-ton behemoth _ called the “massive ordnance penetrator,” or MOP _ will be the largest non-nuclear bomb in the U.S. arsenal and will carry 5,300 pounds of explosives. The bomb is about 10 times more powerful than the weapon it is designed to replace. The Pentagon has awarded a nearly $52 million contract to speed up placement of the bomb aboard the B-2 Stealth bomber, and officials say the bomb could be fielded as soon as next summer. Pentagon officials acknowledge that the new bomb is intended to blow up fortified sites like those used by Iran and North Korea for their nuclear programs, but they deny there is a specific target in mind. The Obama administration has struggled to counter suspicions lingering from George W. Bush’s presidency that the United States is either planning to bomb Iranian nuclear facilities itself or would look the other way if Israel did the same. The administration has been careful not to take military action off the table even as it reaches out to Iran with historic talks this month. Tougher sanctions are the immediate backup if diplomacy fails to stop what the West fears is a drive for a nuclear weapon. Defense Secretary Robert Gates recently said a strike against Iran’s nuclear facilities would probably only buy time. Joint Chiefs of Staff Chairman Adm. Mike Mullen has called a strike an option he doesn’t want to use. The new U.S. bomb would be the culmination of planning begun in the Bush years. The Obama administration’s plans to bring the bomb on line more quickly indicate that the weapon is still part of the long-range backup plan. After testing began in 2007, development of the bomb was slowed by about two years because of budgetary issues, Whitman said, and the administration moved last summer to return to the previous schedule. North Korea, led by Kim Jong Il, is a known nuclear weapons state and has exploded working devices underground. The United States and other countries have offered to buy out the country’s weapons program. The Obama administration is trying to lure Pyongyang back to the bargaining table after a walkout last year. Iran is a more complex case, for both diplomatic and technical reasons. Iran’s president, Mahmoud Ahmadinejad, claims its nuclear program is peaceful and meant only to produce energy, but the West suspects a covert bomb program that may be only a year or so away from fruition. Details about Iran’s once-secret program have come out slowly and often under duress, as with last month’s surprise confirmation of the hidden underground development site near Qom. That revelation came a month after the Pentagon had asked Congress to shift money to speed up the MOP program, although U.S. and other intelligence agencies had suspected for years that Iran was still hiding at least one nuclear development site. The MOP could, in theory, take out bunkers such as those Saddam Hussein had begun to construct for weapons programs in Iraq, or flatten the kind of cave and tunnel networks that allowed al-Qaida leader Osama bin Laden to escape U.S. assault in Tora Bora, Afghanistan, shortly after the U.S. invasion in 2001. —I hope this isn’t overkill to submit this article link. MOSCOW, Oct 13 (Reuters) – Russia in a new review of its policy on use of nuclear weapons will reserve the right to undertake a pre-emptive strike if it feels its security is endangered, a senior Kremlin official told a Russian newspaper.